Renna’s parents both lived in Oakland and worked in a cannery at the time of the 1930 census. His mother, Christine van den Akker, was of Dutch ancestry, born in Holland, and had immigrated to the United States in 1909. She married William G. Renna, who was a Pennsylvania native with two Italian immigrant parents. Bill was their first-born – William Beneditto Renna, born on October 14, 1924, in Hanford, California. He attended the Woodrow Wilson Grammar School and then graduated from Hanford Union High School. After high school, he went to the University of San Francisco for a year (playing right field for the U.S.F. Dons) and then joined the United States Marine Corps, serving from July 1943 to December 1945. After the war, he went to Menlo Junior College for a year. Renna received a football scholarship to the University of Santa Clara and graduated with a B.S. in Business Management in 1949. Renna told Nick Diunte in a 2008 interview, “Paddy Cottrell my coach at Santa Clara was a bird dog [scout] for the Yankees. He used to teach us everything that was taught in spring training by the Yankees.” Cottrell, wrote Diunte, “tipped Yankees scout Joe Devine to his prized outfielder who signed Renna in 1949 to a contract for $5,000.”7 The signing was first reported on June 1, 1949.8 Two days after signing, he was in Idaho. He was assigned to the Class-C Pioneer League and played outfield for the Twin Falls Cowboys. He played in 76 games, batting .385 with a league-leading 21 home runs. The Cowboys, managed by Charlie Metro, finished atop league standings. His contract was not directly with the Yankees, Renna explained, but with Beaumont – even though he never played a game there. “The Yankees owned the Beaumont team in the Texas League,” he explained. “The Yankees would sign players, but not necessarily to a Yankee contract, because then they would only have three-year options on the player. If they signed a player to a minor-league club, they’d still have the options on the player in the future.”9 One can imagine the Yankees were pleased with Devine, not to mention Renna and Cottrell. At the end of March 1950, Renna was sent to Kansas City to play for the Blues (as was Whitey Ford). Triple-A baseball may have been too much for Renna at the time, and he hit .203 in 27 games. Part of the problem, though, was a serious thigh pull he had suffered in the very first week. By the second half of June, he was with the Class-B Norfolk Tars, where he still struggled, batting .227 with nine home runs in 86 games. Healthy again in 1951, he played for the Class-B Quincy (Illinois) Gems of the Three-I League. He hit .296 with a league-leading 26 home runs and was named to the league All-Star team. Renna’s 1952 season was back in Triple A with Kansas City, and this year he excelled. He hit .295, homered 28 times, and drove in 90 runs. He made the All-Star team and Kansas City won the playoffs. Bill Skowron’s 31 home runs led the league, but Renna may have done so had he not broken the middle finger on his right hand and missed the last month of the season. He did get back in time to play in the playoffs. Kansas City won the first three games of the Little World Series against Rochester, but Rochester came back and won the next four. Renna was elevated to the major-league Yankees in October, and brought to a preseason “school” in Glendale, presided over by Casey Stengel and coach Frank Crosetti. After a week, Stengel said, “He’s a better ball player than the record shows.”10 Renna showed well in spring training and edged out Bob Cerv for the fifth outfielder on the team. He stuck with the team all year long, platooning with left-handed hitting Gene Woodling. Renna batted and threw right-handed, stood 6-feet-3 and was listed at 218 pounds. Renna’s big-league debut came at Yankee Stadium on April 14, 1953. It was the bottom of the eighth inning, there were two outs, and the Philadelphia Athletics had a 4-0 lead over New York. He pinch-hit for Ray Scarborough and fouled out to right field. On April 19, in Philadelphia, he got into his second game after Gene Woodling was ejected by umpire Ed Hurley for too strenuously arguing a strike three call. He grounded out his first time up and struck out leading off the seventh. But when he came to bat in the top of the eighth, the Yankees had a 3-2 lead, two outs, and the bases loaded on three walks. Renna singled to left field, driving in Phil Rizzuto and Mickey Mantle and taking second base on an error by the left fielder. His first start was on April 30 at Comiskey Park. In the top of the fourth in a scoreless game, Mickey Mantle homered off Gene Bearden and Renna followed suit, back-to-back, with a “high screaming wallop into the upper stands in left.”11 His home run stood as the deciding run in the 6-1 game; Whitey Ford got his first win of the season. Renna later tripled and singled in the game. He hit one more homer, in Detroit on August 26 – the day his son Barry was born. He and Leronne “Roni” Jeane Richards had married on January 20. After the World Series, Renna went to Puerto Rico. The Yankees of the era were often in the World Series, but Renna wasn’t with the Yankees by the end of the year. He was part of a large 11-player deal on December 16. Key figures in the trade were Vic Power going to the Philadelphia Athletics for Harry Byrd and Eddie Robinson. Along with Power, the Yankees sent Renna, Don Bollweg, Jim Finigan, Johnny Gray, Jim Robertson, and $25,000, and they acquired Loren Babe, Tom Hamilton, and Carmen Mauro in addition to Byrd and Robinson. He didn’t miss out on a World Series check, though. The 1954 Yankees didn’t return to the World Series; the Cleveland Indians did. The Athletics, however, sank to last place (51-103, under manager Eddie Joost.) Renna played right field, and got into 123 games, with 474 plate appearances. He hit four points below team average, batting .232. He walked enough that his on-base percentage was .302. His 53 RBIs was second-best on the team, behind Gus Zernial (62). And he had his share of key hits, including beating the Boston Red Sox with a pinch-hit single at Connie Mack Stadium in the bottom of the 10th inning on May 26. On his son Barry’s first birthday, August 26, he hit a two-run homer off Don Johnson of the White Sox in the second game of a doubleheader in Philadelphia. Never again did Renna appear in as many games. He turned five double plays as right-fielder, leading the American League, though he committed an uncharacteristic seven errors. The most he committed in any other year was one. The franchise moved to Kansas City after the ’54 season, so Renna returned to the city he’d played in before, now with the Kansas City Athletics. Lou Boudreau was the manager. Renna played in an even 100 games, the fourth outfielder on the club, more or less platooning with Enos Slaughter, who got into 108 games, batting .322. The team advanced to sixth place in the standings. Renna’s plate appearances dropped considerably, to 284. His batting average dropped to .213 (.305 OBP), and his RBIs declined proportionally to 28. The 1956 season started with Renna in more or less the same role, spelling Slaughter. Renna was hitting for a higher average, and was at .271 by June 14, when he was traded back to the New York Yankees (with Moe Burtschy) and once again Eddie Robinson was part of the deal, this time Robinson departing New York (with Lou Skizas, from the International League’s Richmond Virginians.) One could make the case that Renna was traded for himself.14 Renna was sent to Richmond. It was Renna in Richmond for the rest of 1956. He appeared in 87 games, batting for a .312 average with 20 homers and 76 RBIs in what remained of the season. During spring training 1957, there was a rare Yankees/Red Sox trade, with Bill Renna being traded to Boston for Eli Grba and Gordie Windhorn on March 14. 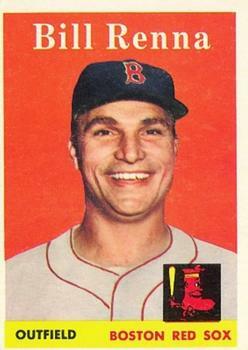 In 1958, Renna was back in the big leagues with the Boston Red Sox. He played throughout the year, mostly pinch-hitting but occasionally helping spell Ted Williams in left field. He said as much: “I was Ted Williams’ caddy in Boston. Gene Stephens and myself; he was lefty and I was righty. We’d play left field whenever Ted didn’t play.”16 Just as he had difficulty breaking into the Yankees outfield a few years earlier, now he faced one comprising Ted Williams, Jimmy Piersall, and Jackie Jensen. The pitcher who gave Renna the most trouble was Billy Pierce of the White Sox. In their first 16 matchups, Pierce struck out Renna 12 times. Three other times, he walked him. The only hit he had was a single, until September 10, when he hit a two-run double off Pierce to tie the score, ending the Pierce jinx. Somewhat bizarrely, Renna at this point had a .553 slugging percentage: he had homered twice and hit five doubles, but only had three singles. One might have thought he would have had more work in 1959. Ted Williams suffered a pinched nerve in spring training and never fully recovered, hitting only .254 for the season. But after a decent spring, a severe virus hit him on the eve of the season and Renna couldn’t get going, either. He was batting only .118 after his last start in left, and was hitting just .091 with two RBIs on May 20, the last day in which he appeared in a big-league game. On May 21, the Red Sox purchased the contract of Bobby Avila from Baltimore and released Renna outright to the San Diego Padres of the Pacific Coast League.. The Padres pinned a lot of their hopes on him, GM Ralph Kiner saying, “If Renna hits, we’ll win. If he doesn’t, we’ll finish second.”18 As it turns out, they finished third, 6 ½ games back. Renna played in 92 games for the Padres, but his batting average was .234. In 299 at-bats, he hit only five home runs. It was his last year in baseball. He announced his retirement in November. The 1960 San Jose City Directory shows that Renna had taken work as a loader for the Ford Motor Company. The family lived in San Jose. In 1963 he became a sales manager for Central Concrete Supply. By 1977 he had become sales manager for Pacific Ready Mix, and eventually undertook work for Kynell Concrete as sales manager, then vice president, and ultimately general manager. He retired in 1990 from Raisch Ready Mix after working in Sales Management. Bill retired to enjoy traveling with his wife, family, and friends, and to relax at their cabin and camp in the Sierras. His double ringers were a common occurrence at the mountain horseshoe pit and he was in great demand as a partner for tournaments. Bill’s wife, Roni Renna, was a registered nurse. In addition to their son Barry, who became a police detective in Portland, Oregon, Bill and Roni had two other children, Mari and Jan. Mari has been the Principal and Managing Consultant for Advancing Healthcare Operations and Jan has worked as a District Forester for Sierra Pacific Industries. In retirement, Renna lived in San Jose until his death there on June 19, 2014. In addition to the sources noted in this biography, the author also accessed Renna’s player questionnaire from the National Baseball Hall of Fame, the Encyclopedia of Minor League Baseball, Retrosheet.org, and Baseball-Reference.com. Thanks to the Renna family for reading this biography in advance of submission. 1 Rich Marazzi, “Bill Renna Was A Two-Sport Star in College,” Sports Collectors Digest, March 6, 1998: 90. 2 Russ Newland, “East Beats West, 14-12,” Washington Post, January 2, 1949: C1. 4 Roger Birtwell, “Sox Right Fielder Pulls Muscle in Throwing Arm,” Boston Globe, March 28, 1958: 24. The right fielder in the headline was Jackie Jensen. 5 Bill Renna, “Key To A Career,” Boston Traveler, March 31, 1958: 13. 6 Associated Press, “Regalado Paces CIBA Players in Batting Figures,” Los Angeles Times, June 1, 1949: C2. 7 Nick Diunte, “Bill Renna, 89, Played with Yankees, Athletics and Red Sox 1924-2014,” http://www.baseballhappenings.net/2014/07/bill-renna-89-played-with-yankees.html. 8 Associated Press, “Yankees Land Pair of Santa Clara Players,” Los Angeles Times, June 3, 1949: C2. 10 United Press, “Two Draw Praise from Stengel at School,” New York Times, February 8, 1953: S2. Gus Triandos was the other one who impressed Stengel. 11 Louis Effrat, “Bombers Trounce White Sox, 6 to 1,” New York Times, May 1, 1953: 26. 13 Unites Press, “Don’t Pine To Be Yanks, New A’s Say,” New York World-Telegram, April 24, 1954. 15 Bob Stevens, “Big Bill Renna, Ex-Yankee, Now Raps for Red Sox Bid,” The Sporting News, September 11, 1957. 17 Ed Rumill, “Morning Practice, Inspired by Williams, Helps Renna Deliver Key Hit,” Christian Science Monitor, May 15, 1958: 14. It was in this article that Renna described himself as one of the “rinky-dinks” who otherwise only got five swings in the cage during batting practice. 18 Jerry Magee, “Pads’ Flag Hopes Ride with Renna,” San Diego Union, May 26, 1959: 25.